I have been losing weight while using this and feel great. I have been taking this daily for over 7 months, and have lost over 12 KG's. I have noticed feeling much lighter (so to speak!). and feel healthier. It has regulated my body and is gentle and natural. How great is that? I rate this a buy now, but I would buy 2-3 bottles so you give it a good go. I think you really need to take every day...read more like a vitamin, and need to take for at least 2 months before really feeling and noticing a difference. Elanveda's triphala/balance is great for internal cleansing. It is gentle, natural and I love that it is non habit forming for your body. In fact, it is like a supplement and helpful in many ways. I used this every day and have for going on 8 months now. I actually take 3-4 tablets a day, it says 2 but I know that is not enough (read up on triphala). Love that they make sure the product is clean and safe of heavy metals etc. I recommend this hands down. 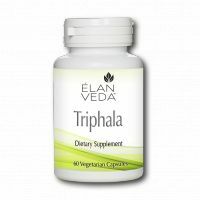 ElanVeda's Triphala - Balance is "GREAT" I use this for over-all health and internal cleanse. I have been taking for 6 months and I love it. I take 4 capsules in the evening before going to bed. I have actually lost weight, and I am feeling much more energized. I am thinking it is because it is doing such a great job of keeping my colon clean. GENTLE, non addicting and ALL NATURAL, you can't beat this product. Great for the price.